Karah Estate Vineyards and Winery is located on 144 acres in the hills of the Petaluma Gap. Founded by Mohamed "Michael" Karah, a native of Libya, in 1995, the site above Highway 101 in Sonoma County is ideal for Pinot Noir and Chardonnay. 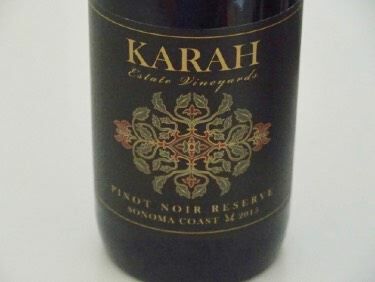 The site was originally named Windy Hill Estate Vineyards, but was changed with the 2008 vintage to Karah Estate Vineyards with a renewed commitment to producing high quality, affordable Pinot Noir. There are six separate vineyards primarily planted to Pinot Noir (Northface, 12 acres of Pinot Noir planted in 1995), Terrazas de Oro (4 acres of Pinot Noir planted in 2005), Spirit Hill (7 acres of Chardonnay planted in 1995, grafted to Pinot Noir in 2002), Rock Garden (5 acres of Pinot Noir), Clones (1 acre of Pinot Noir next to main house), and Vesinos (12 acres surrounding the winery planted in 2000 to three selections of Pinot Noir bud stock from Burgundy). The property was used by the famous environmental artists Christo and Jeane-Claude to create their Running Fence piece in 1976 so the winery is rich in history and folklore. The Pinot Noir wines are sold on the website and inexpensive. Older bottlings under the Windy Hill label are also available. The wines are inexpensive. A tasting room is located on one side of the production barn and is open Friday-Sunday.